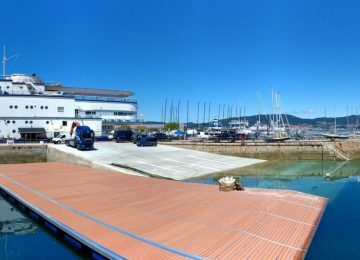 Nice weather again at Vigo, Spain, where the 2018 Laser Master European championships are being held. 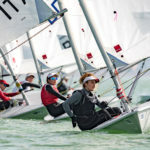 Lazy and tricky winds delayed races in the afternoon, making sailors to launch their boats at 14:30 and return to shore around 19:00 after a bunch of hard races. 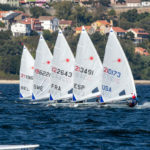 Two new races per fleet were completed today, counting 6 now in total for the Laser Standard and 5 for the Laser Radial. 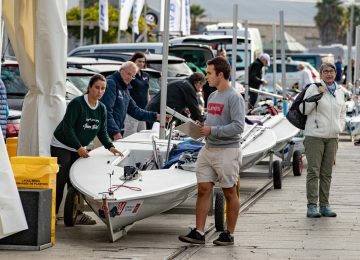 Three races scheduled for tomorrow, starting at 11:30, deciding who will be our new 2018 Laser Master European champions! 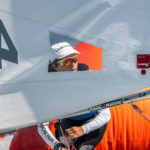 Apprentice Master Jordi Capella ESP (9-1-2-1-2-9) continues to lead the Laser Standards fleet with 15, followed just 3 points behind by Grand Master sailor Alan Davis GBR (3-4-1-8-23-2) with 18. 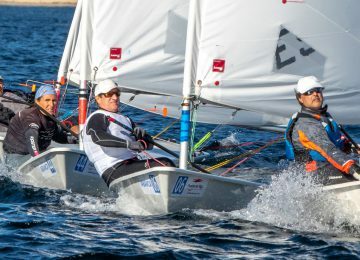 Third place overall and first Master sailor is Roger Schulz GER (4-5-15-15-8-3) with 35. Australian sailor Mark Bethwaite AUS (18-9-11-4-33-8) now comfortably heads the Great Grand Master’s fleet on 6th place overall. 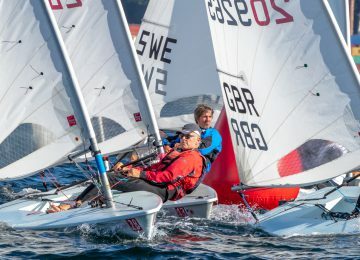 GGM European championship is still on hands of German sailor Wolfgang Gerz GER (15-7-7-31-44-21) but now seriously chased by Michael Hicks GBR (33-16-8-10-15-55), just 1 point behind him. 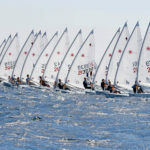 Very close to him are the Master sailors Ian Jones GBR (2-2-7-3-3) and Alessio Marinelli ITA (3-4-2-5-2), also showing a remarkable performance. Great Masters are on a tight end, with Rob Cage GBR (4-3-15-1-18), Pierrick Amizet FRA (8-19-5-7-6), Pieter Van Laer BEL (11-14-3-16-5) and Max Hunt GBR (6-5-20-13-9) ranked 4th to 7th overall and separated only by 10 points. Monica Azon ESP (22-13-4-4-13) is women’s leader on 8th place overall, followed by Giovanna Lenci ITA on 18th. Jean Philippe Galle FRA (13-16-22-6-15) had his best performance today and reinforces Great Grand Master’s leadership on 12th place overall, followed 16 points behind by Mike Kinnear GBR on 17th. 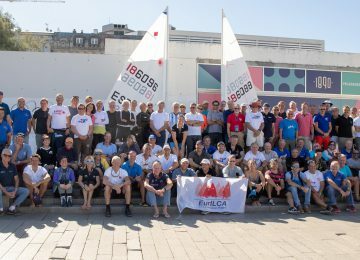 Legend sailor Jacky Nebrel FRA (20-30-19-33-16) is ranked 23rd now overall with 85 units. 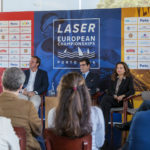 Don’t miss the Laser Master’s European action and follow us on Facebook, Twitter, Instagram and YouTube.